On Monday night, I sat down to watch a presumed pitchers duel featuring successful AL West starters Garrett Richards and Dallas Keuchel, which I suppose says something about both the 2014 baseball season to this point and me as a person. Richards, who’d entered the game with a top-10 FIP in baseball, disappointed, needing 27 pitches to get through a three-run first inning. He managed to avoid a disaster and actually stuck around through seven innings, but allowed 12 base runners, five runs and a mere lone strikeout, if whiffing Chris Carter even counts. I’m sure there’s a good starter in there, but being as this was the first time I’d had the opportunity to really watch him this year, I haven’t seen it yet. And Keuchel? Well, I’m fairly certain this is the first time we’ve ever written about Keuchel on the main page of FanGraphs. He shut down the Angels on two runs over 8.2 innings for what was very nearly his second career shutout, five days after shutting out the Rangers for his first career shutout. After entering the season with a 5.20 career ERA in 239 innings, he’s now got a 2.92 ERA over the first 61.2 innings of his 2014 — numbers emphatically backed up by a 2.81 FIP and 2.68 xFIP. That xFIP is No. 5 in baseball, tied with Zack Greinke, just ahead of Johnny Cueto and Jon Lester; his swinging-strike percentage is No. 13, right in between Madison Bumgarner and Corey Kluber. You know what? I think we’re finally going to have to talk about Dallas Keuchel. 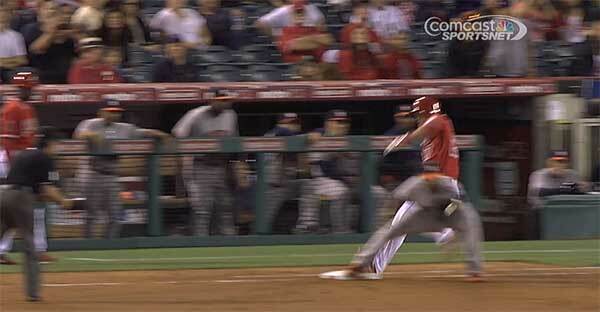 That’s a very blurry Mike Trout running at full speed with two outs in the ninth inning of a 5-0 game to ever so closely beat out a Jose Altuve throw to Jesus Guzman in what was otherwise a game-ending 4-3 putout. That hustle, and the infield grounder that followed to knock Keuchel out of the game, and the triple that Josh Zeid then allowed to Howie Kendrick, prevented me from being able to say “Dallas Keuchel just shut out the Angels and Rangers back-to-back,” and it increased his ERA from 2.63 to 2.92. It prevented Keuchel from joining Cueto, Henderson Alvarez and Martin Perez as the only pitchers with multiple shutouts this year. But of course, Trout and the failings of Zeid hardly take anything away from Keuchel’s performance, and now we need to figure out just where all of this came from and how he’s making it work. It’s not like he was a highly-touted prospect, selected with the 221st pick in the 2009 draft as a junior out of the University of Arkansas, and never — so far as I can tell — appearing highly on any prospect lists. He never piled up any impressive strikeout numbers in the minors, whiffing 323 in 493 innings. Nor does he throw particularly hard, averaging 90 on his four-seam and his sinker and occasionally touching 92. That’s a man with an almost pathological avoidance of the high strike — the kind that, say, a pitcher with a 90 mph fastball might find quickly leaving the park — and it also goes to explain why his Zone percentage of 38.5 is the lowest in baseball among healthy pitchers. There’s a big difference between “being wild” (Francisco Liriano is next on that list) and “throwing a good-looking pitch that isn’t a strike,” hoping the batter will fish for it, and that’s exactly what Keuchel has done — his O-Swing percentage is the third-best in baseball. Masahiro Tanaka, Jose Fernandez, Greinke, and Rick Porcello round out the top five. This is starting to make sense. That’s great, really. That’s a great way to succeed in the big leagues, but something interesting shows up when you look at the 28 pitcher seasons since 2002 with a GB% above 60 — most of them don’t really pile up strikeouts. They live and die on the grounder. Of the 28, only four had a swinging-strike percentage above 10, and one of those was from Kevin Brown, who doesn’t exactly fit the Lowe mold. Another is from Tim Hudson this season, unlikely (as, fairly, is Keuchel) to maintain both of those numbers all season long. Keuchel is one of them, with an 11.6 SwStr%. He never really got strikeouts in the minors, but he absolutely is in the bigs in 2014. First, a graph, helpfully created by Dave Cameron, showing how impressive that combination is. 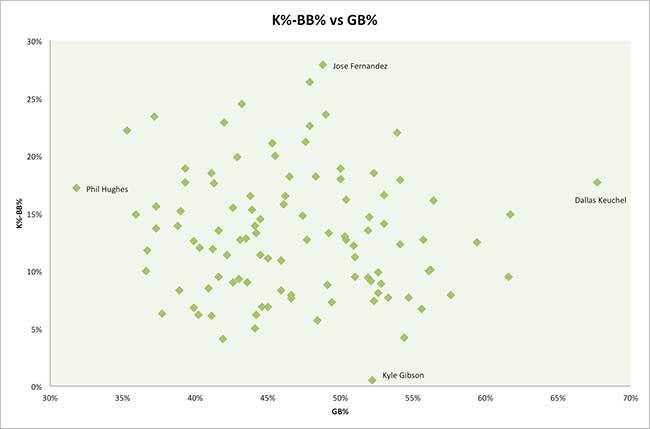 This is a comparison of 2014 pitchers in K%-BB% against groundball rate. This is the guts of what goes into xFIP and it’s pretty simple to follow: the higher your K%-BB% is, the better, because you aren’t giving the hitters back what you’ve taken, and groundballs don’t turn into home runs. You might notice the name all the way out there on the right. Thus far, we’ve established that keeping the ball down, inducing grounders while collecting strikeouts and avoiding walks and homers, is a pretty wonderful way to win baseball games, which I know is a groundbreaking discovery, but what we haven’t yet done is understand how it is that Keuchel managed to turn himself from a low-strikeout minor-league afterthought into, well, this — how a guy who was terrible in 2012 (5.74 FIP) managed to become mediocre in 2013 (4.25) and wonderful in 2014 (2.81). What’s difficult to parse, however, is this: groundballers in front of lousy defensive units can often struggle if their team doesn’t support them. Just go compare Justin Masterson’s ERA to his FIP/xFIP for proof of that. By just about every metric we have, the Houston defense is terrible. They’re No. 28 in DRS. No. 30 in UZR/150. 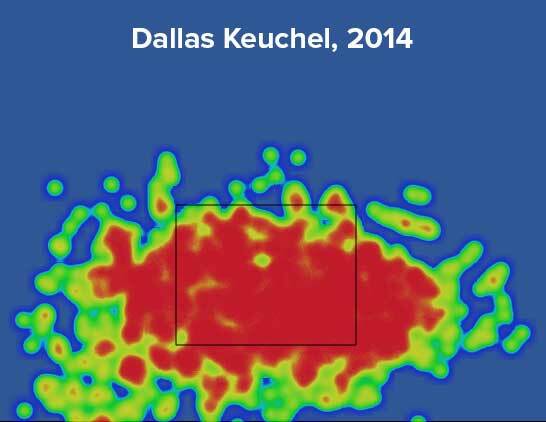 The team leader in DRS is… Keuchel himself, at 3. Matt Dominguez has a reputation as a very good third basemen, but he’s graded out as mediocre. Altuve isn’t highly thought of in terms of the numbers. Shortstops Jonathan Villar and Marwin Gonzalez aren’t, either. And yet what I saw last night was Altuve flying all over the place, making play after play (though his slow throw on the Trout play arguably cost Keuchel the shutout). My sample size here is “one game,” so I’m not taking my observation over the numbers, but then, I do wonder how Keuchel might have done had the expected Houston defense showed up last night. He probably wouldn’t have carried a shutout into the ninth; but missing bats, avoiding walks and homers — i.e., “the three true outcomes” — doesn’t require the defense’ assistance. Maybe we should have seen this coming. Keuchel made clear improvements from 2012 to 2013, obscured perhaps by an ugly ERA and an atrocious and unwatchable team, improvements made clear in his FIP/xFIP/SwStr progression. Then again, he got destroyed in three of his four September starts, so it’s not like it was so obvious that we were foolish for missing it. Now he’s made clear improvements from 2013 to 2014, turning him from a guy fighting for a rotation spot to a guy maybe fighting for an All-Star spot. No matter what happens from here, now you know the name Dallas Keuchel, and can associate him with some success. I don’t imagine that was true for most of us just a month ago. We hoped you liked reading Dallas Keuchel, Who Can No Longer Be Ignored by Mike Petriello! Dallas Keuchel pitched at Arkansas. He was an instrumental part to our 2009 College World Series run. As an Arkansas alum, it’s fun to have a guy from your school have such surprising success! Sorry, he’s *from* Oklahoma, is what I’d meant. Fixed.